Can we build in time in lessons to address frequently occurring misconceptions or simply enhance the feedback we get from learners that can directly inform our immediate next (teaching) steps? Often, a clarification question will have the sole purpose to check that students are on the right track, give us information as to who’s ‘got it’ and thereby give us the cue to move on. But in doing so, there is a chance that we miss out on valuable feedback to inform exactly what our next steps need to be to maximise the learning for all our students. If, on the other hand, we adopt an Error-Seeking mindset, if only for a specific amount of time during the lesson, we can make a tiny change to the clarification question so that what we actually try to find out involves clarifying who is not on the right track and who hasn’t quite got it so that we can respond to whoever might need some additional, more probing questions to secure their understanding. At the same time, we can seize on misconceptions and inaccuracies as ‘critical learning moments’, as valuable diversions and delightful imaginative tangents. So, it very simply comes down to asking NOT WHAT THEY DO UNDERSTAND but rather WHAT THEY DON’T UNDERSTAND. A tiny change in what we ask, look and listen for. Becoming an Error-Seeker involves observing learning-as-it-happens so that we can use all that we see and hear to inform how we frame questions to students so that their thinking continues and deepens. This may be a mindset that you adopt for a specific period of time (very much part of the MLG method see here). As always, when Error-Seeking questions are asked, the choice is still yours as to whether to jump in and offer your expertise or, alternatively, you can decide to hold back and respond to what you hear with additional questions. There really is no right or wrong answer to this; it’s a judgement call for you and will be entirely dependent on the group, what you expect them to achieve and the learning climate you feel you have already established. By deliberately exploiting any insecurities in understanding and knowledge in a such a proactive way, we can go a long way to establish a safe learning environment where ‘failure’ and ‘mistakes’ are redefined as ‘critical learning moments’. In doing so, we ensure that there is a strong sense of AFFILIATION so that students experience a palpable sense of AGENCY over their own learning. One way to establish an environment where you can really use an Error-Seeking mindset is to design opportunities to regularly model ‘great mistakes’ where you invite students to explore what we actually mean by a ‘mistake’ in the first place. My favourite example of this is captured in what I have, for years, referred to as the ‘WD-40′ approach to learning. The story goes that WD-40 is so-called because it took 39 failed attempts to devise a water displacement spray by Norm Larsen before it actually displaced water. Without the tenacity, determination and acquired learning throughout these 39 ‘failed’ attempts, we would not now have one of the most widely known and owned inventions. The Michael Jordan NIKE advert communicates a similar message, but I’ve always had a soft spot for the simplicity and easy-to-remember story of WD40 to illustrate the power of exploration and the value of the process of learning. Plus I always think of my Dad when I see or, more accurately, smell WD-40 as it was a key feature of his shed and tool box when I was growing up. One huge benefit of adopting the error-seeking mindset is that you can very efficiently gather learning intelligence to inform your immediate next steps. 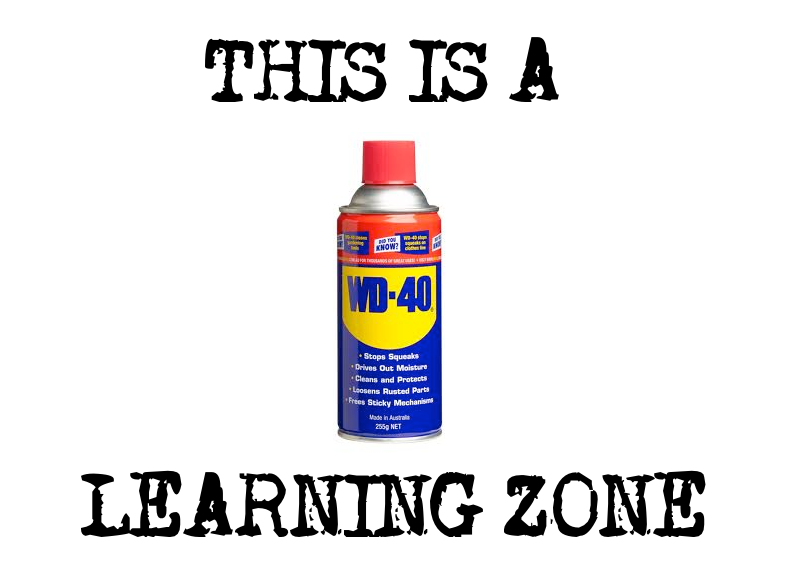 Observing learning techniques are fabulous activities for developing an Error-Seeking mindset as part of a WD-40 learning zone. In this way, you can avoid missing a critical learning opportunity when a student repeats a commonly-held misconception or frequently-made mistake. You can seize that moment and spend some time un-packing it to save time and energy further down the track when you find yourself correcting the same repeated mistake in a pile of Year 9 books, products or performances. You can introduce the FAQ board where students post their confusions, questions and ‘stuck’ moments and other students (including those from other year groups) can post their suggestions for solutions, strategies to get un-stuck and clarifications. If you haven’t got space free in your room, it might be an opportunity for a departmental FAQ board divided into topics, themes and a place where ALL students can help each other. Teachers can then monitor the board and identify common themes and misconceptions that run through a year group. This entry was posted in Marginal Gains, Uncategorized by lookoutforlearning. Bookmark the permalink.